Domaine Rion was founded in 1880 by Pierre Rion. His son Louis substantially enlarged the domaine. 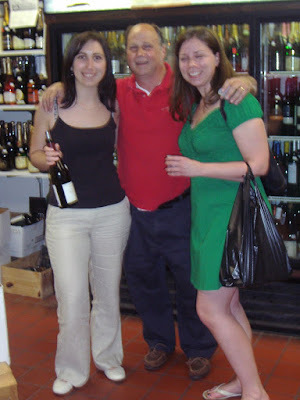 Forth generation Bernard Rion now manages the Domaine Rion with his wife Armelle and his daughter Alice. Wine production is very traditional with a high respect for nature. Vineyard management methods rely on natural or very specific products. 'Pheronomes' are diffused around the vineyards to provoke sexual confusion in certain insects eliminating the need to use insecticides. The average vines are over 50 years old and their roots draw nutrition from deep down in the ground. Besides the wine the family has a passion for truffles. The own four ‘truffel dogs’ who detect the best truffels hidden beneath the ground. Alice Rion was our host. Bernhard Rion greeted us. Domaine Rion is widely available in the greater Washington DC area, as it is imported to the US by Elite Wines, based in Virginia. Domaine Rion is in Vosne Romanée, on the Route National. Domaine Rion was founded in 1880 by Pierre Rion. His son Louis substantially enlarged the domaine. In 1952, the domaine was divided between his 2 sons. The older one, Marcel, stayed in Vosne Romanée. Bernard Rion has helped his father Marcel since 1973 and now manages the Domaine Rion with his wife Armelle and his daughter Alice. Fertilizer: Organic fertilizer is used exclusively on the sandy slopes in order to maintain the structure of the soil. On average our vines are over 50 years old and their roots draw their nutrition from deep down in the ground. Cultivation: The vineyards are ploughed in winter and hoed in the spring. Grass is then left to grow naturally between the rows and a light tractor,(limiting soil compaction), is used to hold it back from invading the vines. Pruning: A preliminary pruning is carried out in autumn, followed-up by a thorough pruning in March. The canes are burnt to prevent any risk of infection. Treatments: Curative only. We use rational management methods relying on natural or very specific products. 'Pheronomes' are diffused around the vineyards to provoke sexual confusion in certain insects eliminating the need to use insecticides. Grape Harvest: Picking is manual, de-stemming is very gentle and there is no crushing. Fermentation: Natural fermentation is long, lasting from 2 to 3 weeks. The cap is punched manually and a stainless steel pneumatic press presses out at low pressure (2kg/cm2), ensuring fine lees on which the wine will mature for 18 months removing the need for filtration. New oak and oak barrels under 5 years old are used for the maturing process. Bottling: Bottling takes place on the estate with the assistance of a specialized bottling company. New bottles are sterilized and the wine introduced under air-tight conditions. Top quality corks from Portugal are then used. Conclusion: As one can see from the above description, every effort goes into producing wines to lie down which will develop and be enhanced over the decades provided they are laid down in a cellar maintained at a constant temperature. Clive Coats: Nowhere is wine more noble than in Vosne-Romanée. Between the Nuits-Saint-Georges premier cru of Boudots to the south and the walls of the Clos de Vougeot at the northern end lie the 240 hectares of Vosne-Romanée vineyard: the most valuable piece of vinous real estate in the world. Appellation Romanée Conti Grand Cru: The Romanée-Conti vineyard dominates the village, with its wines among the most expensive in the world. It is a monopole of Domaine de la Romanée-Conti. Around 600 cases are made each year from the vineyard's 1.8 ha. Appellation La Romanée Grand Cru: La Romanée is a monopole of the Château de Vosne-Romanée. Only 300 cases are made each year from this plot of 0.84 ha. Appellation La Tâche Grand Cru: La Tâche is Domaine de la Romanée Conti's other monopole, and its 6 ha consist of the vineyards of La Tâche and Les Gaudichots. Appellation Richebourg Grand Cru: The 8 ha of the Richebourg cru are divided between 10 growers, including Domaine Leroy and Domaine de la Romanée Conti. Appellation La Grande Rue Grand Cru: The least-renowned of the six grands crus is a monopole of Domaine François Lamarche, and was only promoted from premier cru recently. Its 1.4 hectares lie between La Tâche and Romanée-Conti. Appellation Romanée Saint Viviant Grand Cru: Domaine de la Romanée Conti owns over half of the area's 9.5 ha. Although unable to command the same prices as their grand cru neighbors, the village is home to many excellent premier cru wines. Fifty-eight hectares of this is premier cru, and there are 11 of these. Five of them lie just above the grands crus, six on the same altitude or a little further down the slope. Alice Rion: These balanced and complete wines are traditionally vinified. Totally de-stemmed, with a long vinification (2 to 3 weeks in open vats), and they are then aged for 18 months (half in new oak barrels). They are pleasant and fruity for the young vintages, but well-structured enough to ensure good ageing. located in the border of the A.O.C Vosne - Romanée. For this field, and in all the exploitation, the Domaine Rion makes a sustainable and rational agriculture, by working the soil without insecticides. Marguerite Rion worked all her life in the vineyard of the familial domain with her husband Louis Rion. In its first years, the cuvée Dame Marguerite is really round with a multitude of red and black fruits. With ageing, you will taste forest aromas.